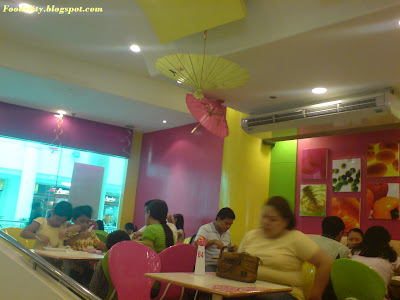 Over-all place: The most colorful dining place in Ayala! Before the known competing fast food chains of the country extended their branches in Ayala Center Cebu, My Joy is already been a long time favorite dining destination for those Cebu-grown patrons. It is known before as MacJoy! I recalled a friend’s online repository of his childhood’s favorite eating place, My Joy. Since, I’m a Negrense who just came to Cebu in 2007 for some serious work, I never had gone thru the dining haven though I usually pass along its pave way. Until such time I read through his blog and I felt the urge to salivate on what it has to offer to my orifice organ! The interior is really colorful with mix combinations of Neon PINK, GREEN and YELLOW. The colors are undeniably striking. In contrast to their ceiling, it’s white! Still the place is really beguiling to kids! They have their own desserts station or what they call as Cooler Bar just by the nook. Oh, I love their shakes, btw. Of course, still enticing to my naked eyes. For the area, they could accommodate a number of customers. There are side couches for those in groups of 4 or 5. If you are on solo fight or with your darling, tables are also set to accommodate your mood of the day. Certainly, these tables could be jointly moved if you’re in a medial team (10 to 12 heads). Simply, if hungry mobs are on queue, you’ve gotta wait for your turn at the counter. Draw the line, please. They also have a water station just by the corner near the counter and well, it’s self-service to those who are able folks! I haven’t noticed any comfort room within the house. Yeah, that’s the first thing I’m looking but found none though they have a lavatory to wash your hands. What I ordered in the menu? 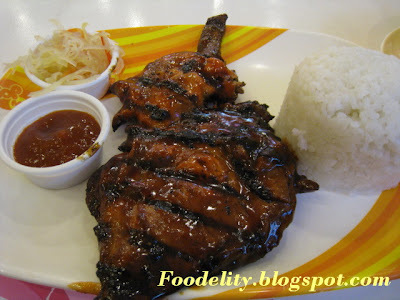 Their Boneless BBQ Chicken and it’s grilled, which is a specialty I should say. It’s moist-sweet but not spicy. Definitely, boneless! They really stick to it! LOL. Served with papaya salad-a typical partner! And banana ketchup for dipping. Cost: Php 112. I also took advantage of their soup of the day, Chicken Asparagus Soup. Broth of chicken strips sprinkled with asparagus. The taste might be tolerable but I just found it quite salty. Cost: Php 39. My online buddy said that their My Joy Halo-Halo is the best so far. Too bad, I was able to crash their Regular Halo-halo only. It’s too sweet according to my salivary glands but I could have requested less sugar in it. I know about it later when I confessed to my buddy that I’ve been there for a self-treat. One thing that I find OK on their desserts is the Mango-Pandan with quaint ice cream (Php 59). The mangos are cubed and are sweetly ripe. The flavored pandan jelly is subtle enough so you’ll savor the fresh mangos. My Joy also offers Combo Savers that are affordable from your pockets and all meals come with iced tea shake! Cool! Right? Prices may range from Php 55 to 130. Just visit their site for more. BTW, they also dish up on burgers (regular, mushroom, chicken and bacon), grills (pork, chicken and tocino), steaks (tangigue, chicken, bangus, beef, pork chop, burger steak), fried chicken at any piece, snacks (taco, hotdog, sandwiches, spaghetti, palabok, fries). And a couple of flavors for their shakes that ranges from Php 45 to 50 (ripe and green mango, pineapple, buko, avocado, four seasons, vanilla, chocolate, strawberry, banana, iced tea). Don’t you have a variety to choose from? *Note: Prices might change without prior notice. The robloxhack is used for the free roblox robux game to play free.